Choa in action in his kitchen. Choa’s special char kway teow. MARUDI: Visitors to Marudi must try the town’s version of char kway teow. The thick texture of the kway teow makes it more like strips of rice cake, rather than the usual rice noodles. Marudi District Council (MDC) councillor Joseph Tiong brought BAT7 to the popular food section of MDC’s market for a very heavy breakfast yesterday. To ensure there is no dispute as to which char kway teow is the best in town, we ordered from two stalls. Stallholder Jong Peng Soon, 57, took a break from cooking to share with BAT7 that he has specialised in the dish for almost 30 years. “I started helping my parents, who used to rent a shop, after I left school at 18. When they stopped, I took over their stall and later moved here and continued serving the dish,” he said. He charges from RM3 to RM5 for a plate of char kway teow, and from RM3.50 to RM4 for those wanting extra meat and egg for his soup-based dish. Jong said as far as he knows, Marudi is the only town in Sarawak serving thick kway teow, which is produced locally. The Hakka Chinese said the legacy of this unique dish would probably end with him as his three children work in different industries. 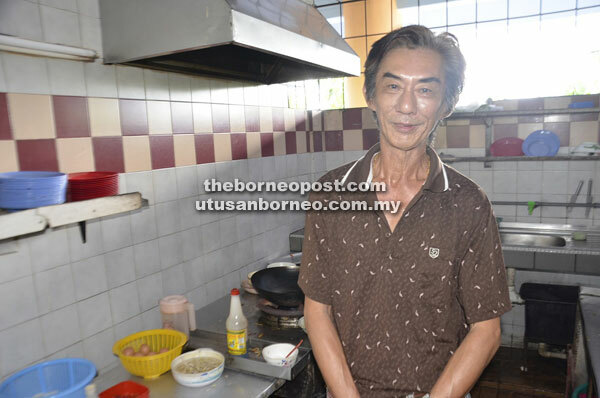 “I am willing to teach someone if they are willing to learn, and this is not about making a reasonable income but to continue in keeping the Marudi kway teow dish in existence,” he said. Fellow kway teow seller Choa Ho Jin, 69, said he started his stall at the MDC market two years ago. “I have been doing the dish for 38 years and knew how to cook it at 14 years old with my parents in Marudi. But after reaching the age of 18, I stopped and I went to work as a shop assistant in Brunei for a few years,” he said. Choa said after Mulu, he went to Kuala Lumpur to stay with his daughter before deciding to return two years ago. “I was restless and as I felt that I am still capable. I thought that I’d stick to do noodle dishes again and thus the kway teow and other noodles,” he said, adding that he would continue until he feels out of energy. Choa charges between RM4 and RM5 for his noodle dishes. BAT7 noticed Marudi town, located by the mighty Baram River, is a food paradise despite being quite isolated from the rest of the state for the moment.